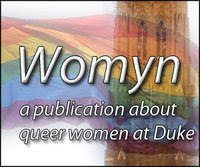 I promised to keep you in the loop about WOMYN, so here's the rundown: Our Senior Layout Editor, Robert Kollenberg, has begun putting the magazine together. We're also working with an artist to create a unique cover design for the magazine, as well as a layout redesign. Finally, just as a reminder, if you're on the Review Board, please return your comments on new submissions ASAP - y'all are the ones who have the power to accept or reject submissions! I don't know if y'all are interested in my eensy saga of grad school applications, but I'll keep telling you anyway. So, I decided to leave my LGBTQ-related activities on my C.V. without offering any kind of explanation. In most ways, it has been a non-issue, but there is one particular incident that was a little unsettling. Some of you know that, in addition to applying to graduate school, I'm in the midst of the scholarship competitions for the Rhodes and the Marshall. In order to be an official candidate from Duke, I had to have an institutional endorsement interview, which works kind of like a mock scholarship interview and a constructive criticism session all rolled into one. As you might imagine, it was pretty stressful, and I was very nervous. The interview was more of a rapid-fire grilling session than anything else - I was asked about a range of things pertaining to my thesis and my personal statement. Some of the questions I couldn't answer (I don't yet know everything about the sixteenth century in France, unfortunately), which didn't really help. The last question, though, sent me over the edge. I was asked what the climate was like for LGBTQ people on campus, and whether that environment had anything to do with my involvement with WOMYN. I was not in any way expecting such a question, and my experience as part of the LGBTQ community is not something that I enjoy explaining to a roomful of complete strangers. Nor is it a story that I should have to tell, especially since my interviewers are human, with their own notions and prejudices that could affect whether I continue in the competitions. I got something coherent out before I started crying uncontrollably (mortifying). Now, let's be clear: there are certain questions that should never be asked, and the one I responded to probably falls under that category as well. My situation is a little different - because it was not a job interview, I don't think that there is any kind of legal issue at stake. However, I think that every interview should follow the same basic, ethical principles. One of those is that no one has the right to force you to come out (or to out you) in any setting. We still have to negotiate a world full of prejudices and injustices, and in many states (and other nations) we have no protection against discrimination for being LGBTQ. So, know your rights, people, and assert them if you have any doubt about a situation. My story has a happy ending, or perhaps a new, happy beginning: I am continuing on in both scholarship competitions, which is very exciting. I don't know how much farther I'll get, but even being at this point is amazing. Jennifer, I'm really sorry you had to go through that. They may have been trying to get you to open up on an issue they thought you'd be passionate about, but it sounds like they went about it in the worst possible way. That's a seriously terrible question. Even assuming it hadn't pulled up so much emotion, the way it's framed suggests that they expect you to have negative things to say about Duke, and it's just weird for them to prompt you onto a topic like that. Frankly, it's unprofessional, and they didn't really leave you with any good answers to give. I'm impressed that you made it through, and super-excited for you that you're still in the running for both scholarships! Hopefully this whole saga with have a happy ending. Ps. I'm glad you posted that link -- apparently it's illegal to "ask for original name of an applicant whose name has been changed by court order or otherwise," which is going to make my job interviews better. Or, well, if they're awful, at least I'll be filled with righteous indignation. Even though it was a mock interview, if they had asked the question in a real interview, and you had kept yourself composed and simply denied to respond to the question, would you have been ok with yourself? I know that this is your future, but if you couldn't get into a school or get a job simply because of your sexuality, would you really want to go to that school/job in the first place? Hey, Lawrence! I know that there was absolutely no malicious intent - they were trying to redirect the conversation, because it had gotten way far afield and was maybe a little more of an interrogation than they liked. But, yeah, it was a poorly-considered choice. I'm glad you found my link useful - even if we don't have absolute equality, at least there's something out there to protect us in the professional world! Hi, anonymous! Thanks for reading! The issue is that I could not keep my composure, regardless of the answer I gave. All of the graduate and scholarship programs to which I am applying have specific nondiscrimination clauses which include sexuality. Additionally, it is actually illegal for a potential employer to ask about your sexuality, your age, your health, your birth name if it's been changed, etc. Academia is also pretty damn queer, especially in the liberal arts (which is what I do), so unless I were to go to a school with an extremely conservative religious background, I should be fine. However, it is always valuable to suss out the environment at a potential job/school/internship, because you're right, constant hostility is untenable. Jennifer - while I am certainly sad that your interview experience troubled you, I do have to say that I think it is only fair that those items you convey as being important enough to be on your CV will be brought up in an interview for a scholarship. There are definitely respectful (and other) ways to do that, and asking about your sexuality or gender would not be a respectful way to go about it. But if you listed being a part of "Womyn" as a part of your life (the "V" in "CV"), I could certainly see a question about your impression of the campus climate for LGBTQ people as well as any potential impact that might have on your participation as being fair - again, if done respectfully and if done not from a perspective of interrogating *your* personal space but rather your opinions on the climate. I might be way off base here, but thought I would offer that. Also - and sorry for not putting this in the above - congrats on going to next round! I agree - I made a choice to put WOMYN on my CV because it is important, and I knew that it might come up. And there are ways to ask about my involvement that are more respectful. I have to admit, though, that if someone isn't necessarily part of the LGBTQA community or maybe just a little out of the loop, then that person might not know how to ask respectfully. (This is yet another example of why Ally Training is SO important!) Honestly, my biggest problem was that they had been so focused on my academic achievements/goals (and seemed really skeptical about them) that a question about my involvement with WOMYN and LGBTQ life just came completely out of the blue. Should something like that happen again, I will be prepared for it, and hopefully I'll take it much more gracefully! First of all, congratulations! I'm glad you got through, and I wish you the best of luck moving forward. As for the business of the question they asked you, I'm of the opinion that it was way out of line. I think it would have been fair to ask you questions directly pertaining to your work on WOMYN or your view on the LGBT community in general (though depending on what exactly you put in your CV, that might be too far as well). That said, to ask you about your personal experience of being queer at Duke, that's pretty damn personal. Also, though I don't really know exactly how these interviews work, it seems to be a bit irrelevant. I mean maybe they were trying to genuinely curious, but curiosity lies in a personal discussion, not an interview that's going to affect your chances of getting a scholarship. Just my two cents. Sorry you had to go through that. Still, good job on getting through!